Reprints from film requiring digital manipulation or overlays. Critical density and color balancing. Available from APS, 35mm, 120, and 220 color and B&W negatives, slides, and transparencies. Five minutes of digital time that includes cropping, and digital burning and dodging are included with no additional charge and implemented in our digital department. For additional adjustments, see Digital Time. The image is saved to a CD and then printed on the Noritsu D1005 HR. A guide for cropping and color-matching are required. Additional time may be required to produce a guide. A photographic restoration of a photograph. This process goes above and beyond the Digital Copy Print. Each photograph is scanned and analyzed for density and color balance. Originals can be up to 12×18 in size. Digital restoration photographs are printed on our Epson Inkjets at sizes up to 44″ in width. Cropping is available and images are saved to a CD with no additional charge. Additional restoration is available with our Digital Time service. 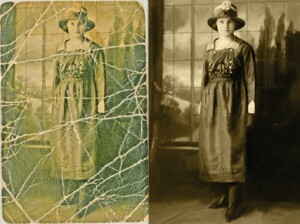 Digital restoration of damaged photographs. $1.25 a minute or $75.00 an hour. Digital files professionally printed on matte or glossy photo paper. JPG preffered, other formats accepted. Critical density and color balancing available. Digital Reprints are analyzed for density and color balance. A guide for cropping and color-matching are required. Options include color, monochromatic, and sepia prints. Border options also available as a weighted full frame border (98% of image) or equal borders. Index prints (contact sheets) available for when you need to see all of your files in a particular folder/cd etc. Reflective/Transmissive scans for flat 2D media and film, made ready to work for you. For precise color matching and/or other adjustments, see Digital Time. For 35 mm and 120 mm scanning to CD, see film scans. 1 block east of Alvernon on Pima Street, on the northeast corner of Pima and Village.